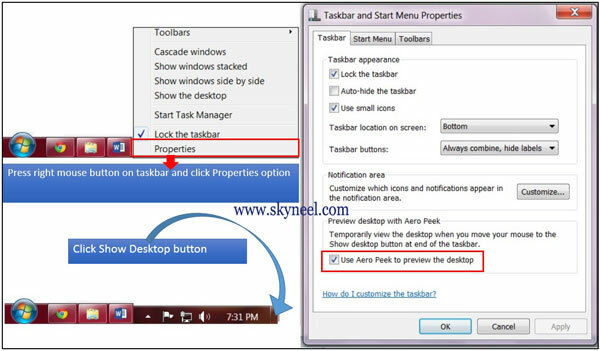 Aero Peek is a latest feature in Windows 7 operating system enables us to quickly transfer your control on the desktop area without clicking on minimize button of all opened windows. When you take your mouse pointer on the show desktop button which is located on the extreme right corner of your taskbar, all active program windows are become transparent or convert in an icon and placed in the taskbar, to quickly allow you to watch the desktop items. You can also easily disable aero peek feature. Note: You can press “WIN+D” shortcut key to quickly show your desktop area. Step 1: First you right-click on any vacant area on the Taskbar then select “Properties” option. Step 2: Please Unmark or Turn off following given feature “Use Aero Peek to preview the desktop” >>> Now, click OK button. Step 3: Now your Aero Peek feature will be disabled from your computer. Within a micro second with the help of Aero peek facility of Windows 7 Operating system you can quickly active your desktop area and hide all opened application windows. You can also change or set the execution timer of Aero peek facility by type “regedit” command (This command is used to open Registry Editor window) in Run box then find this path. KEY_CURRENT_USERSoftwareMicrosoftWindowsCurrentVersionExplorerAdvanced. Now open this file DesktopLivePreviewHoverTime. If this registry file is not found then you just create a new registry file with the name of DesktopLivePreviwHoverTime. Now you can make the changes by setting figure 500 in Value data box then check mark on Decimal option now click OK button. After making edits in the registry file you must need to turn off your computer and again restart your computer for this file to take effect. Aero Peek is a great and important feature to quickly transfer your control on the desktop area and view, close any one or more gadgets and also able to switch within all opened windows.